Saw Palmetto berry extract improves skin and scalp conditions, and helps reverse hair loss or Androgenic Alopecia. This herbal remedy can either be taken as a dietary supplement (320 to 480 mg) or used topically.You can take this supplement twice daily. When applying it on the scalp, combine the extract with some oil and then leave it on your hair for at least one or two hours.Besides, you may use a Saw Palmetto shampoo. It is advised to consult your physician before trying this method of hair growth. Plus, consider talking to an alternative medicine expert for suitable dosage. 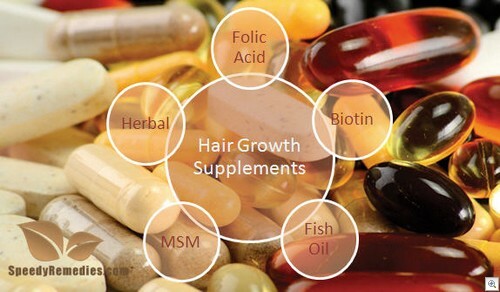 Sulfur assists in metabolizing B vitamins, which in turn help grow your hair. Moreover, it provides strength to the hair. You can take sulfur supplements in the form of MSM (methylsulfonylmethane) capsules and apply sulfur mixes (sublimed sulfur powder) after mixing them in your hair oil.